Cheap and cheerful. No frills but still with some bells and whistles. This best describes the Ovente kettle. It comes in the traditional kettle design, and the brushed stainless steel casing gives it a sturdy and clean look. There are other color choices as well: red and brown (see image at the bottom of page). Both options are shown on the product page and can be selected before ordering. A nice visual gimmick is the changing lights which correspond to each of the five temperature settings. 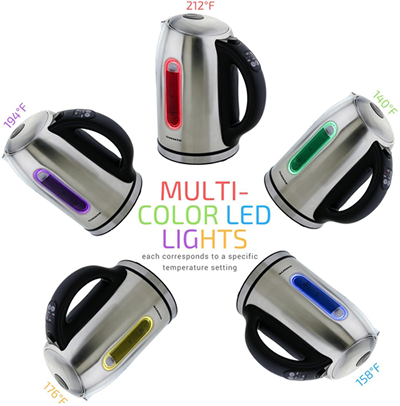 For example, the green LED light indicates 140°f/60°C, red for boiling with other colors in between. From all the reviewed kettles, this is the lightest (2.1lbs / 1kg). Ovente offers a one year warranty provided you register online within 30 days after the purchase date. The full kettle (1.7l) boils in about 7 minutes. Once the temperature is reached it lets you know with a beep. In case the beep annoys you there is also a quiet version available (KS89S, see here). 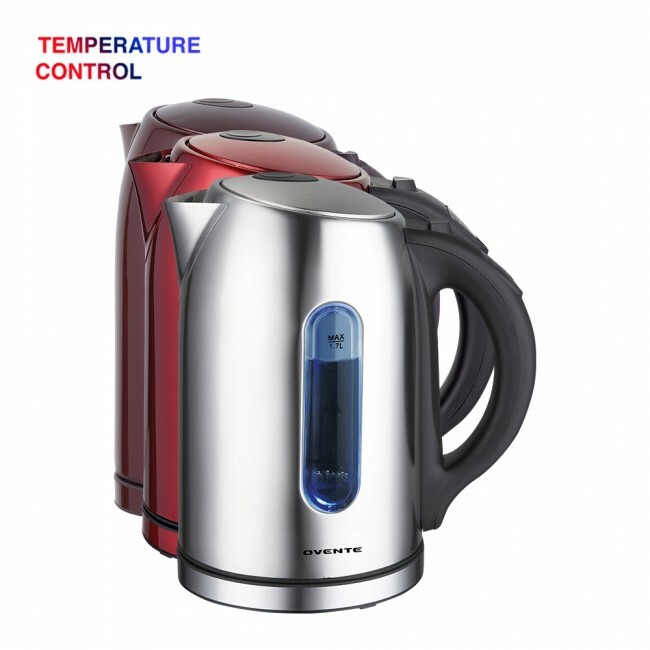 The range of programmable temperatures is sufficient for all teas, coffee, baby food, etc. When you turn on the kettle, the default setting is “Boiling”. There is no extra temperature button for it which might be slightly confusing for some. For any other temperature, you simply press the +/- button until you get to the desired setting. 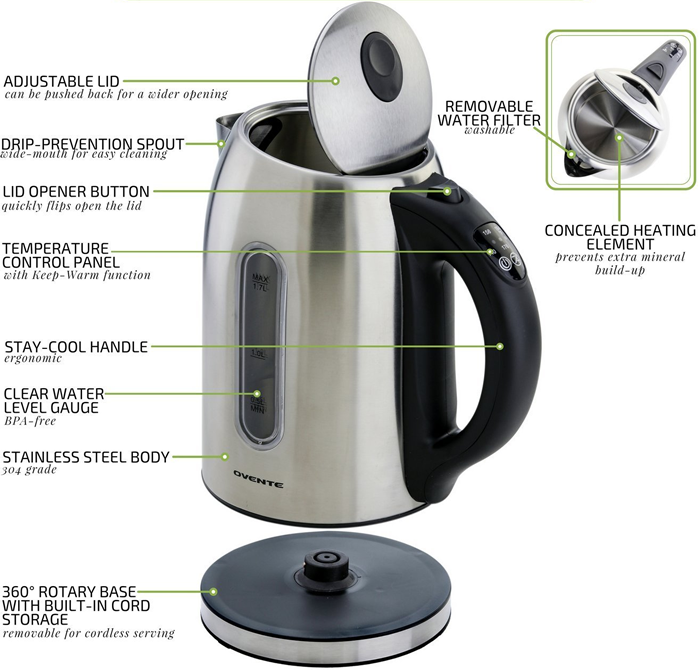 The Ovente kettle has all the necessary features of a modern adjustable kettle and is BPA free. For a list of all features see here. Suitable for $ low budget. 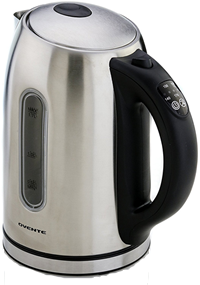 If you are on a budget or you just want to try out a temperature controlled kettle, or you are looking for a second device for work, your hobby room or garage the Ovente kettle is an excellent choice. You probably don’t get a lifetime of service from it, but for the offered price and the included features, it is an attractive and highly recommended package. For more info and to buy from Amazon click here.